Initially, this manicure started life yesterday as an accent mani... and an ode to the character killed off in PLL 5x12 Taking This One To The Grave... AKA PLL's most recent #fatalfinale. I won't spoil it for you here, but eventually, I'll be linking my soon-to-be-written review here... so... you've been warned! 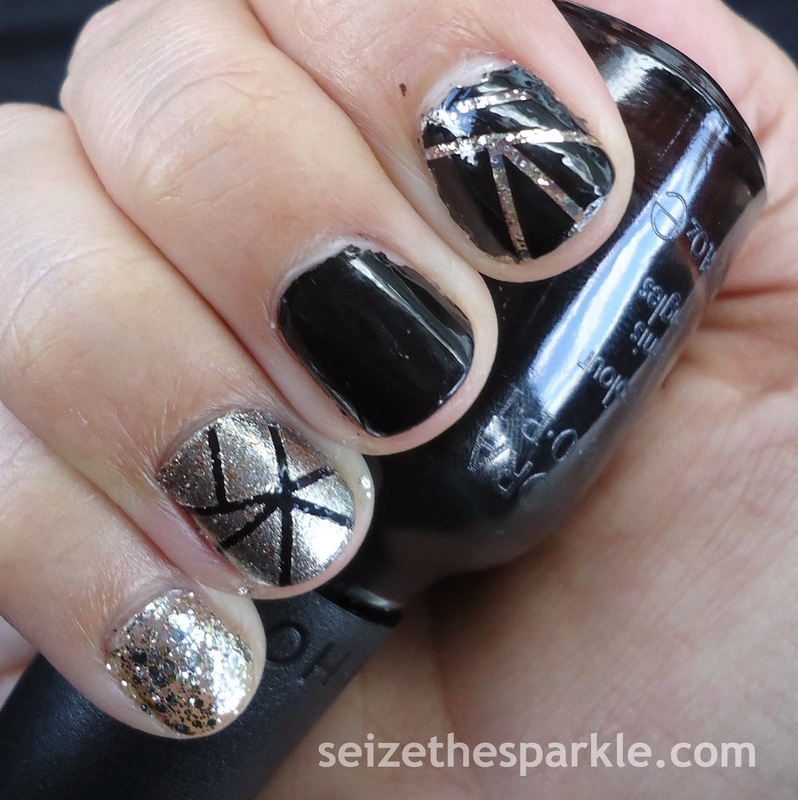 While I was painting my nails Tuesday night, I remembered a striping tape manicure I'd seen featuring gold and black that I totally should've pinned at the time and didn't. Sorry. 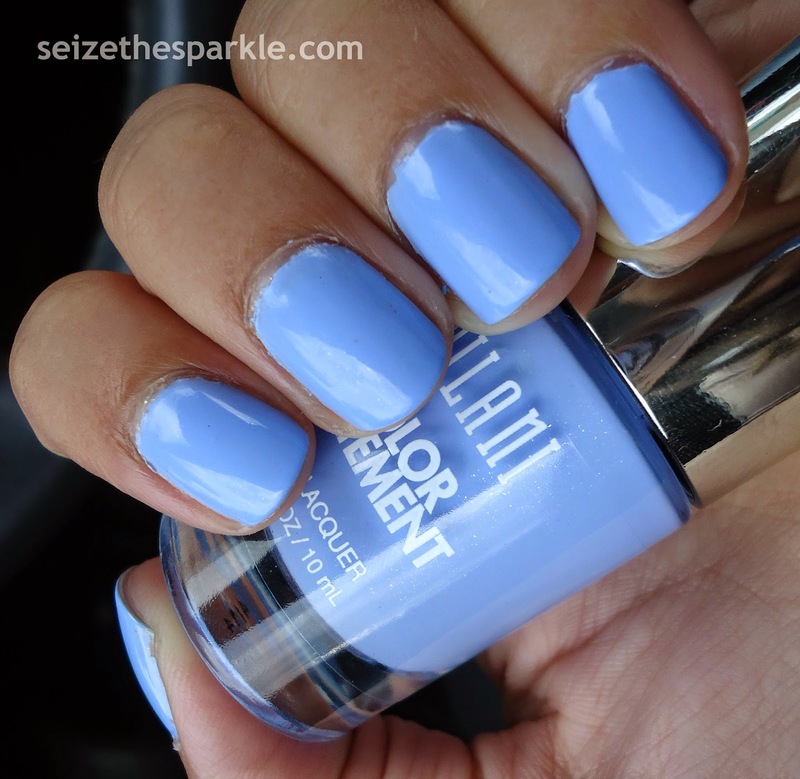 :( Right then and there, I decided that the accent mani I was working on would turn into this! I used a mix of striping tape and invisible Scotch tape on my nails. I've used striping tape before, but this was the first time I'd worked with regular tape. I was pretty pleased with how it turned out. Working with striping tape gets easier the more you work with it. There are a couple of places on my nails where the tape didn't stick as well as it should. I also have one nail that didn't really turn out like I had planned, but 9 out of 10 isn't bad right? Overall, I'm really pleased with how this turned out! 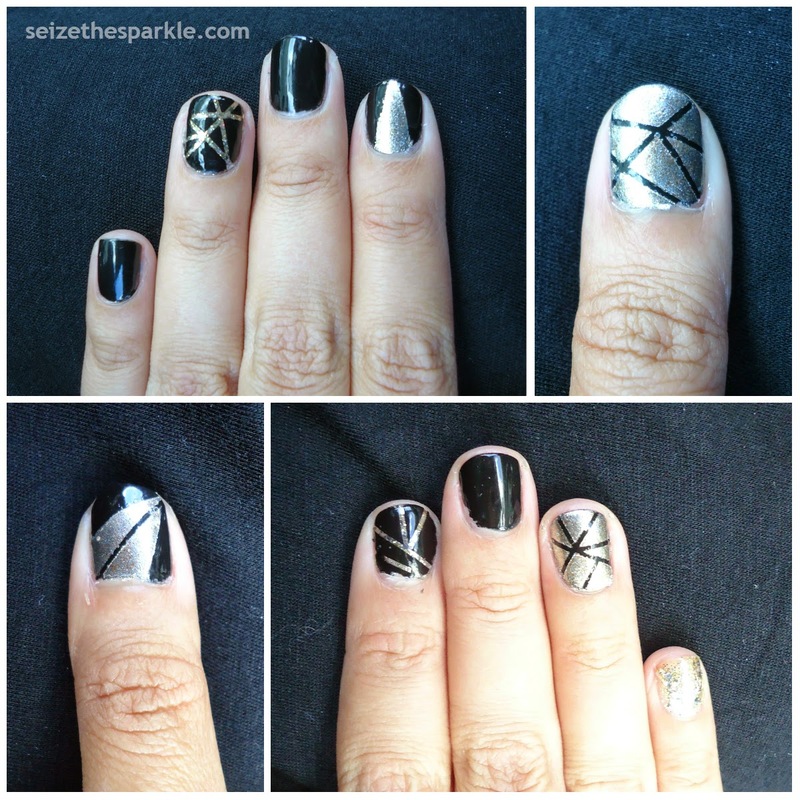 What do you think of my Geometric Mani? So, I had every intention of doing a Pretty Little Liars inspired manicure for today, and it just didn't happen. I blame it all on the theorizing my brain has been trying to do lately. 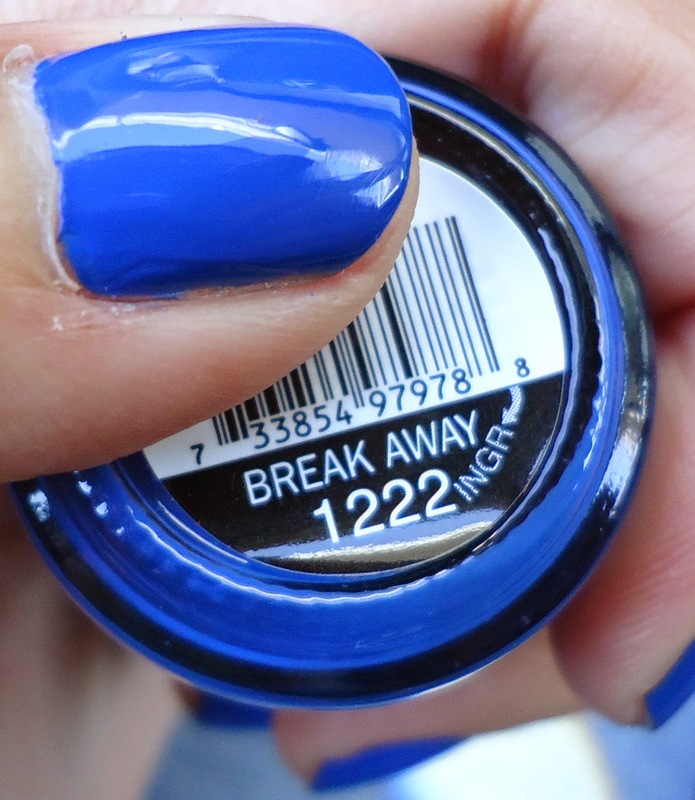 I also blame Doctor Who, because this is totally TARDIS blue, which I did not realize until right now whilst typing. Trust me, my photos turned Break Away into a brighter cornflower blue than it actually is in real life. 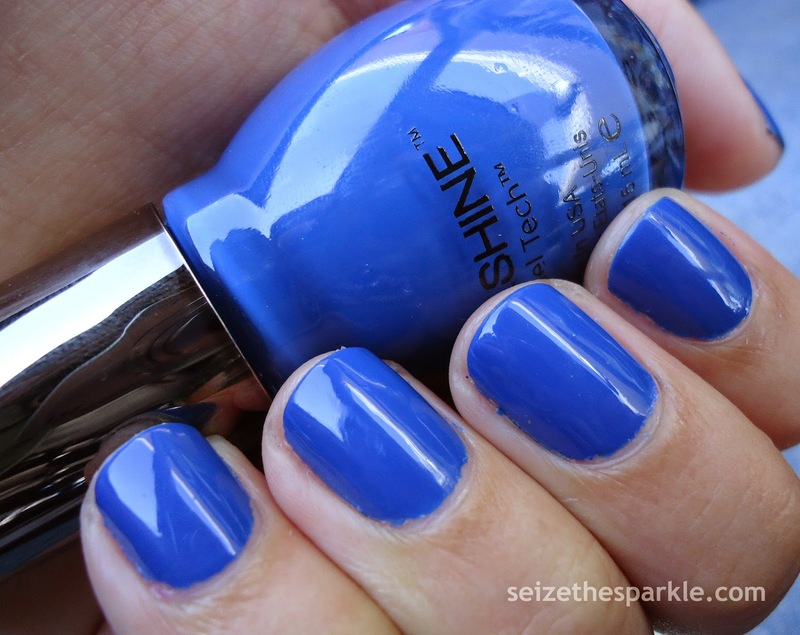 I haven't tried all of my SinfulShine polishes, but I've been pretty pleased with them so far. The brush is easy to work with and the formula is great! I probably could've gotten away with two coats, but I tend to always err on the side of more is better... so three. it. was. It's been so long since my last full-fledged Jelly Glitter Sandwich... and even longer since I've worn Zoya Paloma! Last time around, I layered this lovely raspberry jelly with China Glaze Your Present Required. This time, I paired it with silver, gold, and pink glitter! 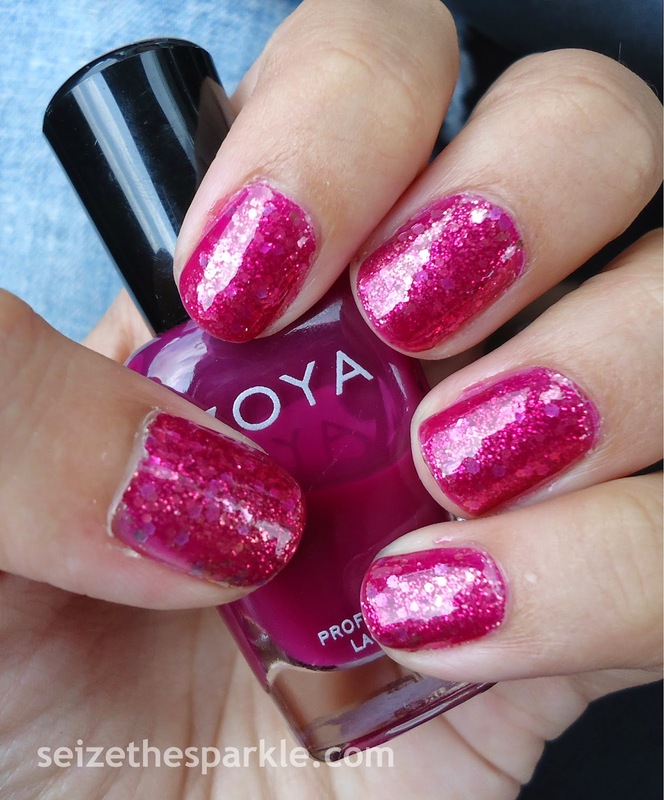 On its own, Zoya Paloma is a gorgeous raspberry pink jelly! Since I layered it with more of a multi-colored glitter last time, I decided to try to keep this sandwich a little more uniform in color. Rosie Lee is a fine pink glitter polish, while The Golden Age contains small and large silver and gold glitter. I sandwiched The Golden Age in between layers of Rosie Lee to add a little more depth to the layering. One coat of Paloma on top transformed the glitter a little bit, but I decided to use a second coat to lock the glitter down just a little deeper! All in all, I really like the effect. Paloma turns each glitter into a slightly different tone of raspberry pink for gorgeous, multi-dimensional sparkle! I'm such a sucker for a good jelly glitter sandwich, and you all know how I feel about sparkle! What do you think of Paloma Rose? First things first, I've gotta say... this color just doesn't want to photograph accurately! What looks like a light blue with lavender ambitions in my photos, is actually a gorgeous, glowing periwinkle blue in real life. Recently, Milani Cosmetics decided to bring all their different polish lines under one umbrella and Milani Color Statement was the result! So far, they've put out their core 36 colors and a Quick Dry Clear Coat which I picked up, but didn't use for whatever reason. I also picked up Ink Spot and Enchanting, but I'm holding off on trying those until I'm in more of an Autumn mood! Application was great! I probably could've gotten away with just 2 coats, but I thought I saw some patchiness on one of my nails, so everyone got a 3rd coat. It was late, and I was in a bit of a hurry to paint my nails after an attempt at nail art went very wrong! I was trying to do a striped manicure while binge-watching Doctor Who, and in the end, the Doctor won and my nail art was scrapped! Anyway... I like this color a lot, but I did think that the shimmer would've shown up on my nails a little better than it did. Thankfully, I bought it for the color and not for the finish! I love that even though Peri-Wink is a pastel, it's a bright pastel, so it still works for summer. I'm not ready to go vampy quite yet. Soon, though! Have you tried any of the new Milani shades? Finally! Gyp-Sea Green is miiiiiiiiiiiine! I've been searching and searcing since Amanda from Pretty Girl Science posted about this collection... and then Yadi from Nightswatcher posted about it... and yesterday, G from Nouveau Cheap posted almost the entire Summer Festival collection! I've gotta admit, I was wondering if I would EVER find it!!! Low and behold, I stopped by KMart on my way home... and found 2 bottles of Gyp-Sea Green just waiting for me to take them home, and also stumbled on a new Sally Hansen Display! The moment I saw Mind Your Manors, I knew this accenticure had to happen. These two polishes were made to go together! Gyp-Sea Green is a gorgeous dusty and squishy teal. Immediately it had me thinking sea water, sand, and tropical beaches. Then I found Mind Your Manors from Sally Hansen. 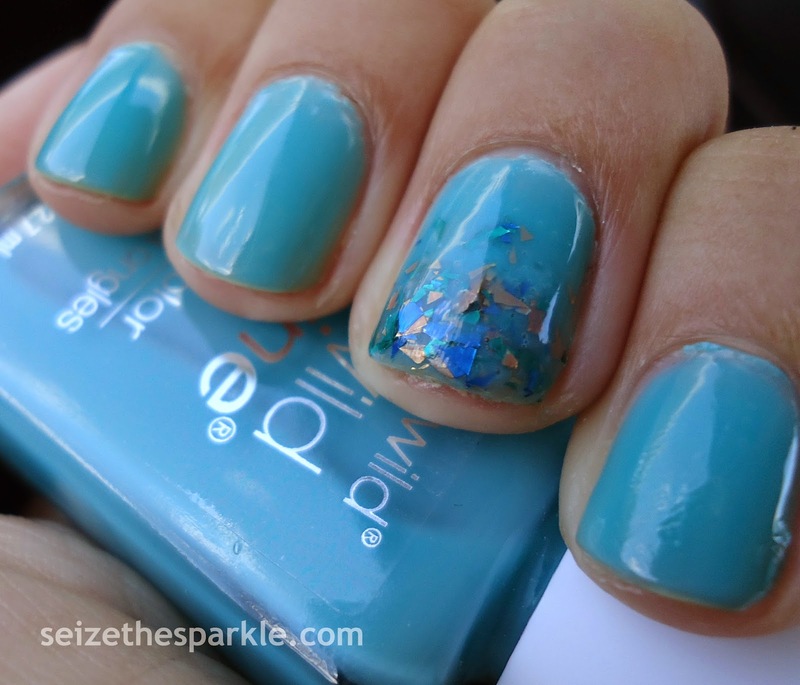 It's a shredded glitter topper with shards of copper, green, and blue glitter in a clear base. It totally reminded me of what you might find gleaming inside a treasure chest. When I started applying Gyp-Sea Green, I wasn't sure how many coats it would take to get the look I was going for, and 5 ended up being just right. On my accent fingers, I painted a coat of Mind Your Manors on half of my nail, then used the dab and place method to fill in any holes. When I was satisfied with the amount of glitter, I added a 5th coat of Gyp-Sea Green to all of my nails. I added a coat of clear, followed by a generous coat of Seche Vite. The glitter shards in Mind Your Manors are a little sharp. I can still feel bumps on my accents, even if they're not visible. That's pretty typical for this type of glitter, though! All in all, I really love how this manicure turned out. When I look at my accent nail, it actually reminds me sunlight shimmering on coral underwater. Soooooo pretty! Have you spotted Gyp-Sea Green or Mind Your Manors? I pinned this over a year ago, so, it's taken me quite a while to actually attempt to recreate the look. Sadly, this blog hasn't been updated in a looooong time which is really sad, because I enjoyed a lot of the looks she created! 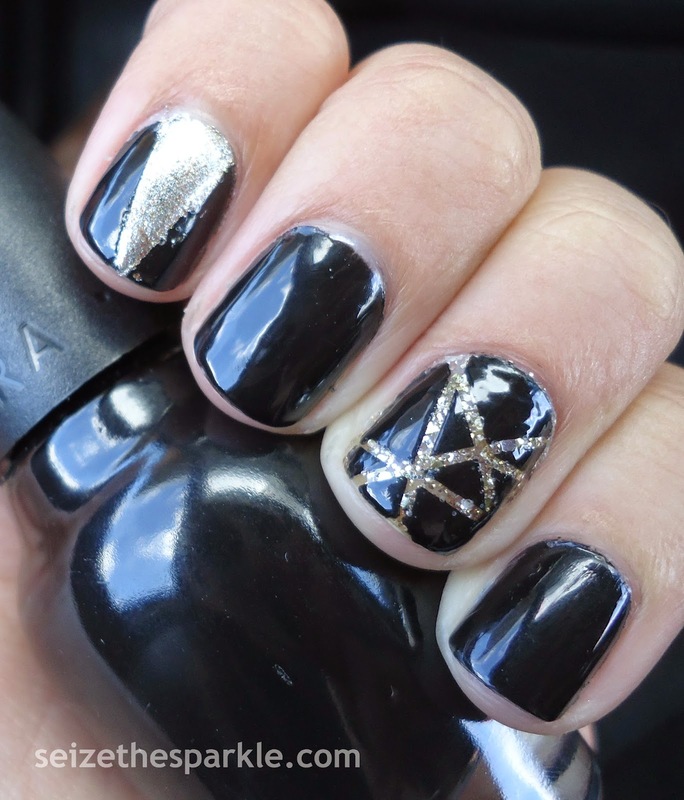 She was one of the first blogs I found that featured short nails! When I painted these last night, I was already wearing Sally Hansen White On. That made the application and removal of striping tape sooooo much easier. It's definitely my recommended method... :) Rather than using just gray and white polish, I opted for a silver glitter accent nail to add in a little something extra, and then I decided that I needed to do another nail on each hand to balance everything out, so I added gray on the top halves of 2 nails. Earlier this week, I stopped by Sally Beauty on the off chance that they might have this collection in stock... and they did! Better yet... the display still had every.single.bottle! Out of 6 original lemmings from this collection, I only picked up 2 after seeing them in person... Five Rules, a creamy greige polish, and History Of The World. I haven't been feeling dark polishes at all recently, given the fact that it's still summer, and I'm hanging on to every last drop of humidity while it lasts! 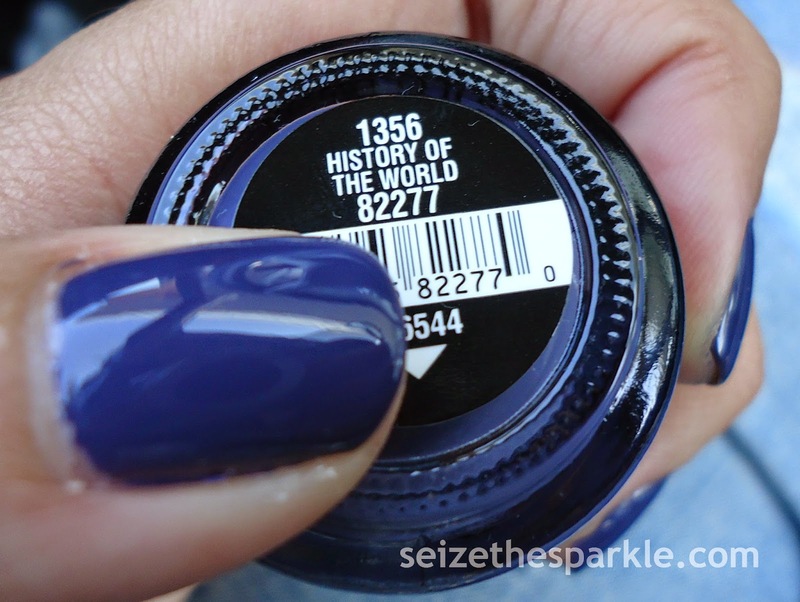 BUT... as soon as I purchased History Of The World, it kept calling to me, begging to make it onto my nails waaaaay sooner than later. Application was flawless, pretty standard for China Glaze in my experience. Two coats would've been sufficient, but I want to enjoy this polish for a little while, so I added a third coat AND wrapped my tips for some extra mileage. 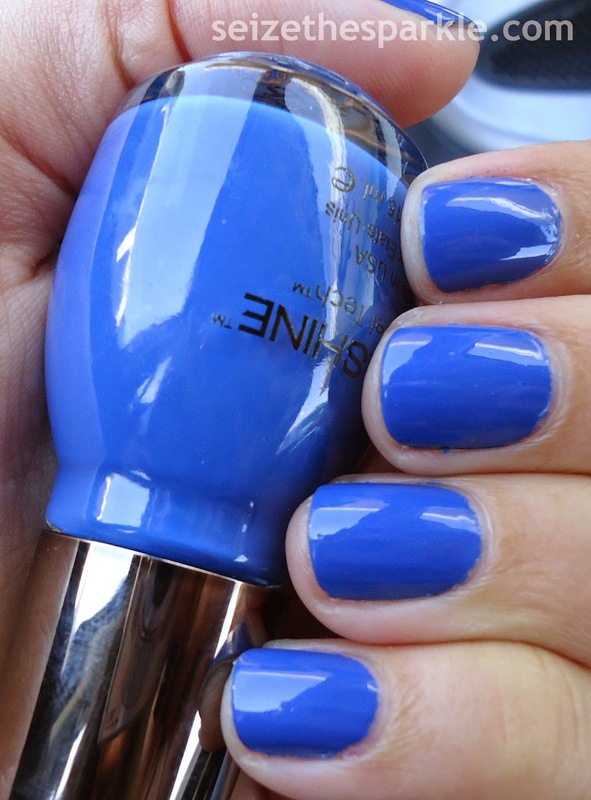 Have you picked up any polishes from The Giver collection?